All I have to do is sew in lots of ends before I wash and block it!! I have started a 2nd one for my daughter in law but this time I am sewing in the ends as I go along! I absolutely love this! Beautiful! That is gorgeous. Is it made up of lots of different yarns? Yes I just used lots of my left over 4ply yarn from making socks and shawls. 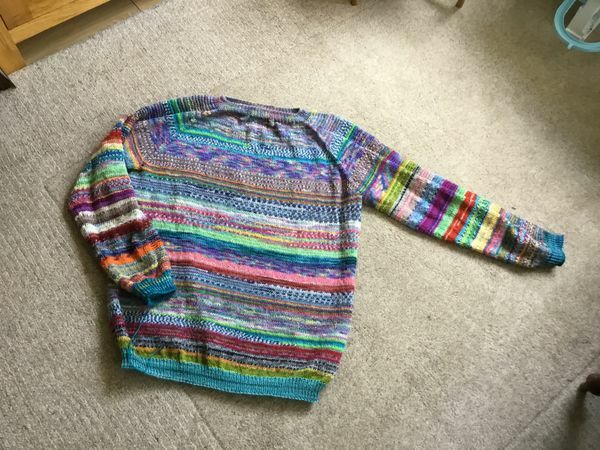 Beautiful sweater and very colorful! I love it. Wow very pretty. Great way to use up all those extras skeins with little bits in them. Love the pattern to and your knitting is wonderful. Enjoy wearing it.